My first wedding cake attempt! I finally finished my wedding cake. The party was a success. I'm very happy that this being my first wedding cake, there was no disaster!!!!!!! I used 10 mixes. Chocolate, yellow and white cake. I used chocolate buttercream for all of it. 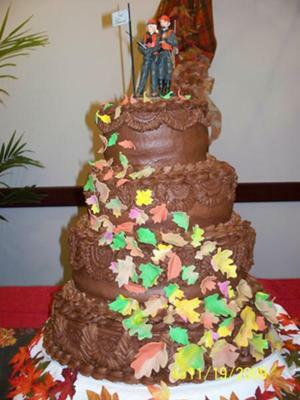 And I made gum paste leaves in fall colors a few days before. The cake topper my husband found at a sporting goods store a few years ago. I hope you enjoy looking as much as I enjoyed making it! What a relief after a success of making a wedding cake....some more it is for your wedding. Lovely leaves...like the colours.